Reliable and affordable domestic cleaning services in Notting Hill W11 performed by professionally trained cleaners from First Class Cleaner. Get a free and non-obligatory quote now! When it comes to cleaning up your place, it’s clear that you have to do it regularly is you want to enjoy hygiene at home. However, there are many people, who don’t have the time to clean and to maintain their homes as well as they would want to. 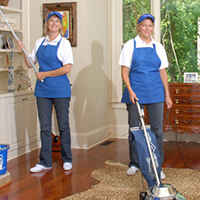 In such cases, using professional domestic cleaning service is the best option. Domestic cleaning is the process of having your home cleaned by cleaning experts, no matter if it’s a small single-room apartment or a big house. Domestic cleaning can be carried our regularly, as the client may choose if they want their place cleaned daily, weekly, fortnightly or monthly. Choosing regular service will give you the opportunity to have a constantly clean place without worrying about spending time or energy on cleaning. Another option is to have your home cleaned one a one off basis. This service is used by people, who want to have their places cleaned for or after a special occasion, such as a birthday party, a New Year’s Eve party, family reunion or anything other event that took or is about to take place in the home of the client.